So you made a batch of garlic confit, now what? 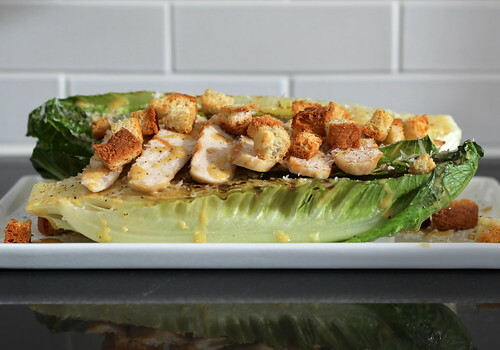 This recipe for grilled caesar salad is an AWESOME place to start, truly, the whole meal revolves around the stuff. Pulling triple duty is the garlic-infused oil — it plays a major role in the homemade dressing, croutons and, finally, on the romaine hearts, they get a quick brush to prevent them from sticking to the grates. Mixed into the dressing are several of the soft, mellow-flavored cloves, their texture adding a touch of extra creaminess. Plus, if you’ve ever found the taste of raw garlic too acerbic in Caesar dressing, this version’s definitely for you, it’s full-flavored minus the bite! Ever since my sister, Chloe, introduced me to grilled romaine heart salads at The Red Fez in Providence, I’ve wanted to recreate the magic at home. But . . . I don’t own a grill, and for some reason I think, rather, I know perching one out on the fire escape is a terrible idea. Thankfully, I recently inherited a grill pan and it works beautifully for this purpose. A quick sear on super hot grates imparts the lettuce with just a touch of smokiness, leading to a salad with a really nice, layered flavor. While I’m the first to roll my eyes when I’m served a salad that is not broken down into reasonably bite-size pieces, here, keeping the romaine hearts basically intact serves an essential purpose: to avoid creating a wilted puddle of lettuce. That would be gross. So in order to make the resulting table-side prep a bit easier, I always set the table with steak knives. Overkill? Maybe. But as silly as this may sound, it makes the experience of tearing into the salad so much more satisfying (not to mention, it’s a way more effective approach). So you tell me, how do you feel about a grilled salad? Even if you don’t own a grill (or grill pan) or aren’t a fan of the idea of a ever-so-slighly-warmed salad, no worries — you can totally skip that step! Preheat oven to 350°F. Place bread cubes in a small bowl, drizzle garlic-infused oil over cubes, tossing to coat evenly. Line a small, rimmed sheet pan with parchment paper or aluminum foil. Arrange cubes in a single layer and bake for about 10 minutes, tossing/turning cubs about half way, or until golden brown. Remove from oven and allow croutons to cool on pan; set aside. DO AHEAD: Transfer completely cooled croutons to a small, zip top bag, eliminate as much air as possible before sealing. Store at room temperature for up to a few days. In a small bowl, whisk together egg yolk through salt (by hand, no machines necessary) until thickened slightly (about 30 seconds to a minute). Whisking constantly and vigorously, slowly drizzle the oil into the egg yolk mixture. If the mixture appears to be separating, stop pouring oil and whisk until the oil is absorbed. Once all of the oil is incorporated, whisk in vinegar; season to taste with additional salt and pepper; set aside. DO AHEAD: Transfer dressing to a clean jar or bowl, cover and refrigerate for up to two days. Just before serving, preheat dry grill or grill pan to medium-high heat. Brush romaine heart halves with a little of the garlic-infused oil. Once grill is hot, place romaine hearts (in batches, if necessary) cut-side down on the hot grates. Cook for 30 seconds – 1 minute, just until lettuce releases and has golden brown grill markings. Using tongs, flip hearts over and cook in the same manner as the first side. Remove to serving plates. and freshly ground black pepper to taste. Serve immediately! ¹ Please note that consuming raw or undercooked eggs may increase your risk of foodborne illness, especially if you have certain medical conditions. ² Please be aware that some Worcestershire sauce contains gluten. Lea & Perrins’ original is gluten-free, but always read the label to make sure! Also, please note that it is not a vegetarian-friendly product as it contains anchovies — there are some exceptions, but I haven’t tried them yet.